People who bought the original iPhone will remember perhaps the most annoying original feature: The long sync. That is, when you plugged the iPhone into iTunes it took forever for it to complete its syncing process. The main holdup was the backup process, that would take a ridiculous amount of time to complete, each time. Luckily, Apple fixed the issue with subsequent updates to the iPhone, and sped up the backing up process to mere seconds. But with iTunes 9, things are starting to look grim again. One main culprit is what should be a nice, new feature in iTunes 9 called “Automatically fill free space with songs.” It does exactly what it says, finds songs to put on your iPhone to fill it up. This is great for people like me with too large of a music library to sync it all with the iPhone, and who don’t really use playlists (the main way to sync music to the iPhone). Unfortunately, if you click this “Automatically fill free space” option, it seems that sometimes it wants to remove and replace much of the random music. If you have a 32 GB iPhone, that is going to take a while. It doesn’t do it every time, it only seems to when you have made a change such as installing new apps, which obviously changes the amount of storage available on your iPhone. That’s somewhat understandable, but it doesn’t make up for the fact that it still takes a long time to complete. And I don’t know why it has to remove 10+ GB of music to install one new app. So easy enough fix, right? Just don’t check that box. Well yes, except that regular syncing itself seems to take significantly longer with iTunes 9 as well. 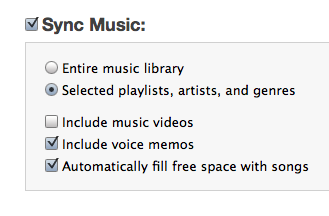 Previously, it would take me about a minute to sync my iPhone with iTunes 8. With iTunes 9, I’m seeing wait times of about 5 to 10 minutes. And sometimes the system just hangs, and you have to manually stop it. This doesn’t appear to be the backing up process, which is still being done in just seconds, but is some other process involved in the syncing. The status indicator simply reads “Syncing iPhone” as the progress bar spins for minutes. Hopefully, this is just a matter of another firmware update from Apple for the iPhone. You would have thought they would have checked the syncing speed on the just released iPhone 3.1 firmware, but apparently not. So now, if I want to sync just a couple of songs before leaving my desk, I have to wait 5 to 10 minutes. It’s like the original iPhone all over again.